What is the impact of the commodities crunch on mining? Anglo American, one of the largest mining companies in the world, has announced a restructure that will cut 85,000 jobs worldwide, a reduction of its workforce by almost two-thirds. 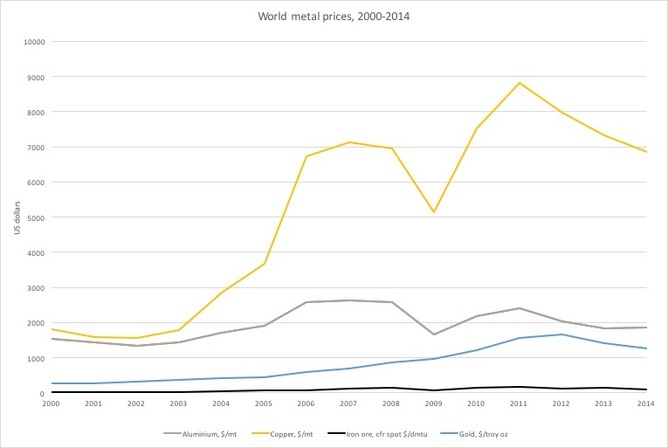 The move follows a huge downturn in commodities prices, which have been decreasing since 2011 and have hurt the revenues and profits of mining companies across the globe. The global mining industry is capital intensive but has high net profit margins, with 20-27% reported in the mid-2000s. Falls in commodity prices detrimentally affect the bottom line and so the decision of Anglo American to slash its workforce – though dramatic – is not altogether surprising. It reflects the global trends across the commodities industry. This will provide no solace to those losing their jobs, however. Lessons from other countries that have experienced mine closures show that cutbacks will have a profound effect on the workers and communities they are part of. The fortunes of the mining industry have mirrored those of the global economy. The boom years before the financial crisis in 2008 saw global commodity prices rise rapidly, along with a boom in mining activity. In 2009, commodity prices dipped, only to recover the next year with rise up to 2011. This was largely the result of continued GDP growth in emerging economies, in particular China, which is the primary consumer of mining commodities. China’s move to a “new normal” economic model that is not fuelled by spending on infrastructure, manufacturing and exports, means its appetite for large volumes of foreign metals and coal is decreasing. As the largest consumer of most commodities, China’s slowdown is the major cause of the slump in commodities prices in recent years. The steady drop in prices of mineral commodities significantly affects large companies such as Anglo American which have generated substantial assets in the production of leading ones such as coal, iron, copper and gold. Over the years, the mining industry grew substantially across the globe, investing in exploration activities, acquiring new concessions and opening new mines along with the boom in commodity prices. This, coupled with years of mergers and acquisitions that consolidated the industry, led to the concentration of major commodities in the hands of a dozen top companies. Lack of demand has led to a plummeting of prices and mining giants are finding it hard to operate in the environment not based on growth. The closure of mines and loss of jobs for mining workers in developing countries will be highly detrimental. Mining workers have particularly low social capital. Operating in remote areas, they are away from their families and friends for long periods and so are less embedded in the social fabric of cities and farming communities. This makes it very difficult for them to draw on support networks when it comes to finding new work. If jobs cuts are inevitable, mining companies should provide training support and assistance for their outgoing workers to find new jobs and help relocate them and their families. Administrative and managerial staff as well as highly skilled mining professionals are the most likely to find other employment. Those with transferable skills like driving and catering could potentially be absorbed into services or other manufacturing industries. But workers who only have skills and experience in heavy industry may suffer and find it difficult to secure employment in the overall economic downturn. Mining is a unique industry in terms of its employment conditions, often requiring mining workers to live in isolated, specially built settlements near mines or travelling between mines and permanent residences in fly-in fly-out arrangements, undertake shift work and spend months away from home. History shows that mine closures often lead to prolonged period of social despair in mining communities. The closure of coal mines throughout England in the 1980s, for example, had lasting negative socio-economic effects on the communities, such as long-term unemployment, poor health and low incomes. Plus local businesses and entrepreneurs servicing and supplying the mines will suffer from loss of business following mine closures. There is perhaps a silver lining to the decline of mining. The environmental impact of this industry is significant. The closure of mines could therefore have positive effects on the local environment. This was the case in Russia following the breakdown of the USSR, which saw a drastic drop in economic activity including the closure of mines and a sharp reduction in CO₂ emissions. But any improvements to local environments only come if closures are conducted well and conservation is properly executed. Author: Natalia Yakovleva is a Senior Lecturer in International Business Strategy at Newcastle University. Image: Mineral ore is offloaded at the Freda Rebecca gold mine in Bindura town. REUTERS/Philimon Bulawayo.